Although plant designers tend to treat them as ‘necessary evils’, it is obvious that control valves play a key role in process quality and reliability. Extreme care must be taken to avoid costly premature failures, possibly resulting in substantial loss and even plant shut-down. Periodical service and testing allows plants to operate for longer intervals. • Seat leakage classification according to the ANSI/FCI 70-2. • ‘Stroking’ of the valve and its controls. 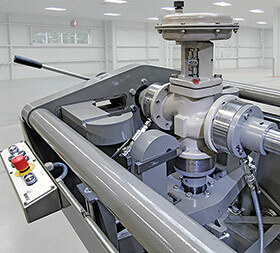 The company’s horizontal control valve test unit is complete with a strong clamping system for quick and easy positioning and clamping of all common Globe, Camflex and Waver type valves in the horizontal position (valve stem vertical). The U-shaped HC10 clamp generates a clamping force of 10 tons and the clamp ensures excellent accessibility for assembly and stroking. The stronger HC combines the above with high pressure liquid and gas testing. The standard HC is complete with sealing adapters for DIN/ANSI RF flanges, but is also accommodates the use of ‘inner seal’ adaptors for control valves with socket weld ends. • Windows operated computer registrations system. • Vacuum quick filling system, electronically controlled. • Hand controlled test and operation systems for actuators. • Digital seat leakage measuring systems for gas and liquid. • Torque test and measuring system 0-500 000 Nm. • Valve support trolley, mechanically or hydraulically operated.